Shockingly, 1 out 2 American adults over the age of 30 has periodontal disease, according to recent findings from the Centers for Disease Control and Prevention (CDC). That means bacteria is in half of our mouths all the time. Yikes, break out the mouthwash! Periodontal diseases range from simple gum inflammation to serious disease that results in major damage to the soft tissue and bone that support the teeth. In the worst cases, teeth are lost. This doesn’t mean coffee is the answer to this major problem but we all need to start thinking about maintaining a healthier smile. Our mouth provides us with nourishment, kisses and most importantly communication so maintaining a healthy mouth will keep you and others around you happy! 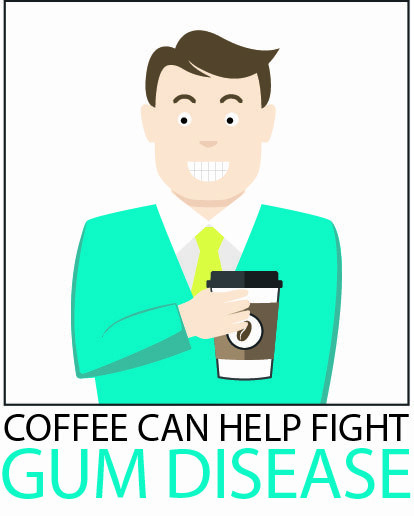 So you think to yourself coffee is probably not the best thing to choose for conscious health benefits but researchers from Boston University’s Henry M. Goldman School of Dental Medicine have found that coffee can help fight against gum disease.